—Margot O’Meara, 2012 Dallas Martin Endowment Policy Intern at NASFAA and Financial Aid-Admissions Fellow at St. Mary’s College of Maryland from 2011-2013. Published in the Journal of Student Financial Aid, Vol 42 No 3. —customer reviews on Amazon from students and parents, all of whom have rated the original FHB 5/5 stars. 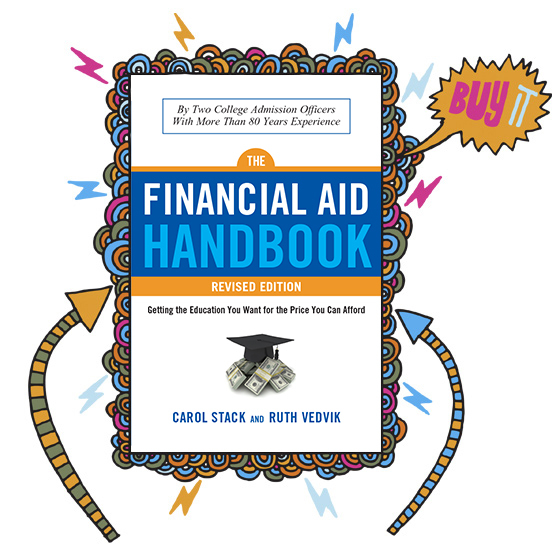 The Financial Aid Handbook is a guide to the financial aid process for college-bound high school students, and there’s no other book on the market that gives you the same invaluable information and advice. We wrote it to help students and families navigate the most expensive purchase they’ll ever make (excepting, of course, a house): their college education. PLUS loans? EFC? FAFSA? CSS PROFILE? If these acronyms are Greek to you now, they’ll be standard slang once you’re finished reading The Financial Aid Handbook. Anyone—and everyone—who wants to finance a college education! We’ve got sections for everyone, including international students (see Chapter 13, “What Color is Your Passport?”) and anyone from an intact, blended, divorced, or even a little bit messy (see “Deadbeat Dads and Moms” in Chapter 4) family situation. We’ll guide you through the entire financial aid process, and teach you how to negotiate your aid awards (both need and merit-based). We’ll also teach you how to find the biggest possible aid award, and we’ve got guides and resources for every single step of the process—from the very first conversation (“So….I kind of want to go to college…?”) to the real meat-and-potatoes of college funding (“So, Mom and Dad….I kind of need….a lot of your money?”). If you’re willing to follow our advice in Chapter 11, you could even cut your total college tuition in half. What’s in Chapter 11? Well, buy the book and find out. That’s simple. To keep your student loans as low as possible. Your college degree is not a medical degree—don’t mortgage your future on it. If you take out too many loans, you’ll be moving right back in with Mom & Dad after graduation, living in their basement. Try inviting someone you really like over to have a nightcap … at your parent’s house … when you are 25. What do you think they are going to say? “Oh, I love baseball-themed sheets on a twin bed!” ? No. They’re not even going to make it to your twin bed, or your futon, or your pull-out sofa in the basement den. You’ll fall asleep watching Netflix all alone, every night, until you can finally afford to move out when you’re 40. That’s super depressing. Don’t let that be you. And parents: Take it from us. Being an empty-nester is amazing. Don’t force your kids back into the nest—get them a copy of The Financial Aid Handbook today.